I've finally got the craftroom in the new house set up enough to do some serious crafting! Now that I have a good place to spread out the mess, I can start working towards my holiday goal of 50 cards by mid December. I'm a really slow cardmaker, so 50 is a lot for me. I will keep posting my progress as I work through my cards and, hopefully, I'll get to 50! Thanks for stopping by! 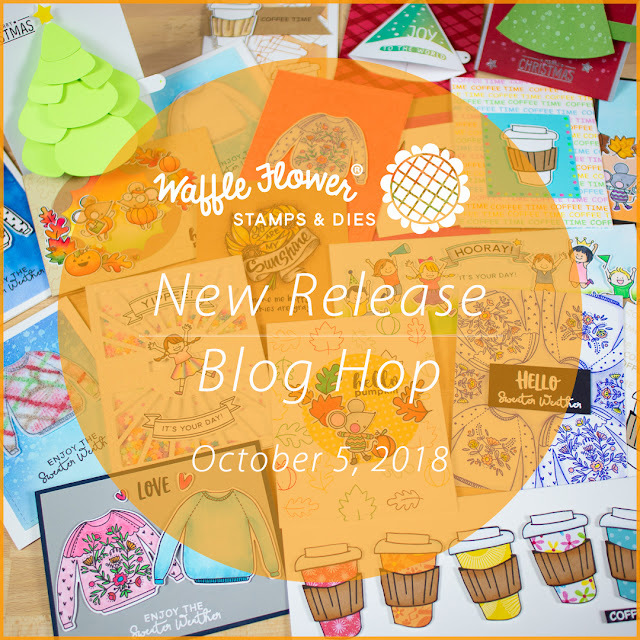 I've been so busy this summer moving to a new house, but I'm so glad that I got my craft room together in time to join in the Waffle Flower October Release Blog Hop! This release has a fun mix of Fall and Winter sets and some really cool 3D card dies. Speaking of which, for my first card I used the Pull Tab Tree Die. 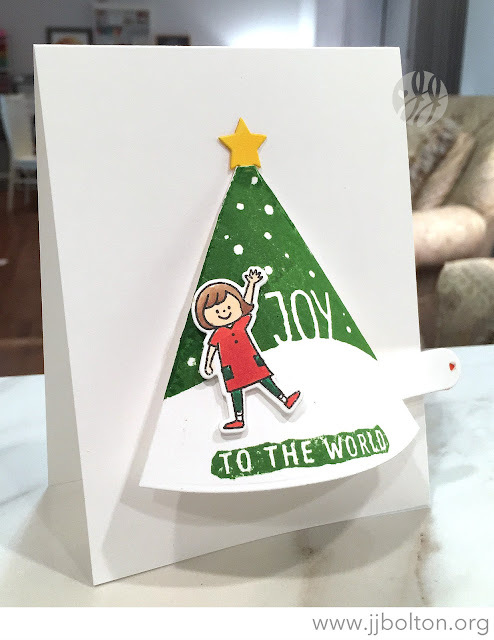 This die creates a 3D tree that lays flat for mailing, but can be popped up with a pull tab. It's like magic I tell ya. Here's a look at the tree laying flat. I love all the Kamo kid stamps, so I couldn't resist adding a little one to my card. See that little pull tab to the right? If you pull that tab, the tree pops out and you can anchor the tag to keep it popped up. How cute is that? Speaking of cute, this release has another kid stamp set illustrated by Kamo called Yippee! These stamps are irresistibly cute. And so much fun to color with Copics! 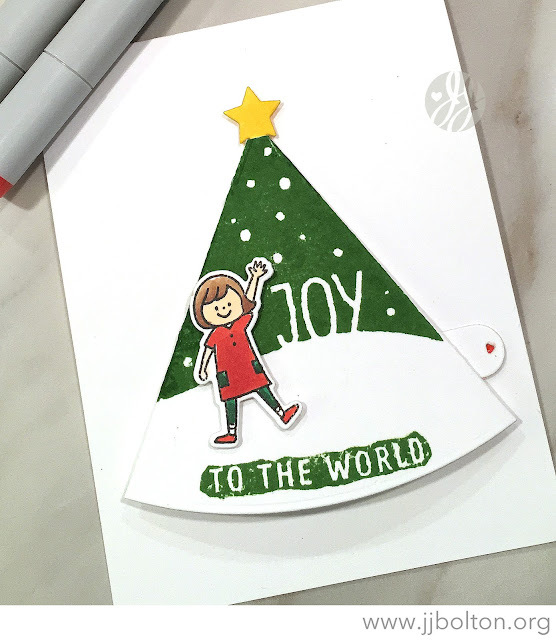 They just make me smile:) I used all the kid stamps in this set to create this fun card for my niece. There's lots of other great products in the release, so go on over to Waffle Flower to see them all! And check out the other release projects from these amazing folks! Did I mention the giveaway and bonus gifts? To celebrate the blog hop, Waffle Flower is giving away $25 gift certificates to THREE lucky winners. You can leave a comment on my blog and along the hop by 11:59 ET on 10/8/2018 for chances to win. Winners will be chosen at random from the comments left on any of the posts on this blog hop and will be announced on the Waffle Flower blog on 10/10/2018. Plus, to celebrate the new release, all orders placed by 11:59 ET on 10/5/2018 will receive a mystery gift (limited one per customer while supplies last). Thanks for stopping by today! Hope everyone has a wonderful weekend!